Welcome to Reykjavík City museum. Five unique places that take you beyond the shore and below the ground. Five museum experiences that cover the Settlement to the contemporary moment. Five fun and engaging ways to enjoy Reykjavík's exciting cultural heritage. There are family-oriented events offered at most of our locations all year round especially during the summer months, winter break, museum night and children’s culture festival. For further information visit our event calendar on the museum’s website. Museum admission is free for children 0-17 years of age. The ferry ride is 775 ISK for children 7-17 years of age, free for children 6 years and younger. 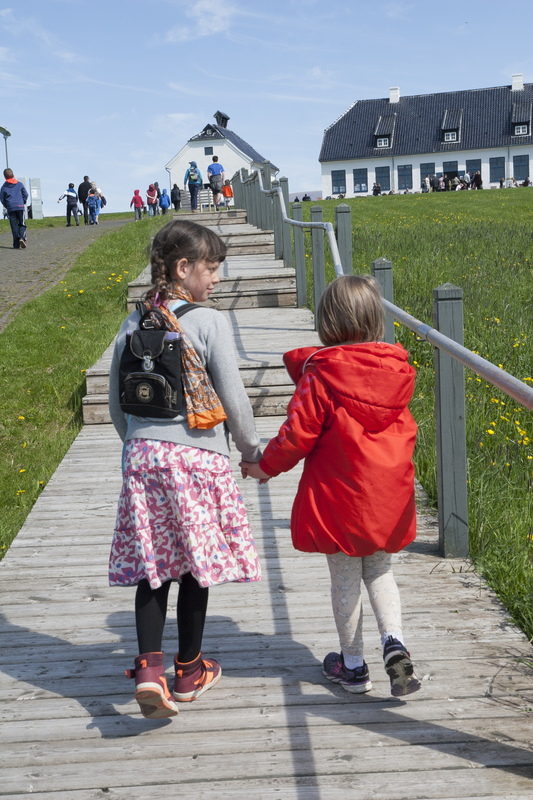 At our family friendly open air museum you can stroll through the past and experience the way Icelanders lived at different times during the 19th and 20th century. Here you can encounter costumed guides, grazing animals and traditional crafts. We especially recommend the Toy Exhibition: Come and play! The exhibition focuses on children's culture, toys and games in the past. This hands-on exhibition is housed in a house called Landakot and suits younger museum visitors. Opening hours follow the museum’s opening hours from 10:00 – 17:00 in June, July and August and from 13:00–17:00 at other times. This multimedia exhibition uses creative technology to immerse you in the Viking age. It includes a family activity area and there are audio-guides available, in Icelandic, English, French, German and Norwegian. The Viking Animals - The Secret of the Settlement, is also a family-friendly and hands-on animal exhibition where animal bones can be unearthed. The museum offers diverse exhibitions each year including historical and contemporary photography in artistic, social and cultural context. The main focus is on Icelandic photography, works from collection and works of foreign photographers. The museum of photography is located on the 6th floor of the Grófin Culture House and library, a convenient family location to enjoy books and photography. The interactive Fish & Folk exhibition is intended to entertain and educate our visitors. The exhibition is has a range of participatory games, photo opportunities in seafarer gear and exploration boards that suit families with children from 6 to 12 years of age. The family exploration boards include puzzles to solve together while enjoying the exhibition. There are three guided tours offered daily on board the former Cod War vessel Óðinn, at 13:00, 14:00 & 15:00 for about 40-60 minutes. This exploration of the ship suits families with older children interested in the vessel, life on board, and its role in the historic “Cod wars” as a former Coast Guard Vessel. Families can enjoy the beautiful nature of Viðey Island, a hidden gem, just a short ferry ride from Reykjavík. The Island has a rich history, birdlife, beautiful vegetation, and spectacular geology. It’s the home of Yoko Ono’s Imagine Peace Tower and Richard Serra’s Milestones There are refreshments available at Viðey House. *Please show consideration for the birds on the island: keep to the marked footpaths and do not disturb nests or nesting birds. Please take care when walking along the cliffs. Come and enjoy the beautiful nature of Viðey Island and refreshments and Viðey House. Viðey Island is a hidden gem, just a short ferry ride from Reykjavík with its rich history and birdlife, beautiful vegetation and spectacular geology. The Island is home to artwork like the mysterious stones on the West Island, the Imagine Peace tower and art called Milestones. *Please show consi­deration for the birds on the island: keep to the mar­ked foot­p­aths and do not dist­urb nests or nest­ing birds.